This hoodie is great for warmups and for wearing on those chilly days! Sports grey hoodie with Tusco.. 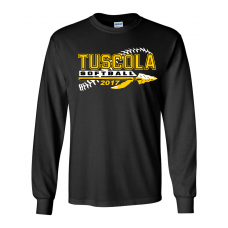 Same great design as our short sleeved T-shirts but with a long sleeve design for those cooler days ..
Great new design for a great softball team! Basic design can be personalized with name and number on..